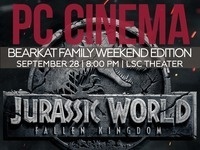 Program Council will show "Jurassic World: Fallen Kingdom" during Bearkat Family Weekend on Sep. 28 at 8 p.m. in the LSC Theater. All currently registered students are invited to join us and enjoy the box-office hit before it is available for home view. Free popcorn is included! For more information, contact Program Council at 936.294.1763 or at PC@shsu.edu. Was the Best Jurrassic movie of all!